One look into the barn of Morningview is sure to impress even the most critical Holstein enthusiast. From daughters of Apple to offspring of Lead Mae there is something for everyone. Known worldwide for developing the Converse Judy family, Morningview continues to work with and develop the breed’s elite. Holstein Plaza took a look at the top GTPI RED heifers (non-variant) in the U.S. and here is what we found. 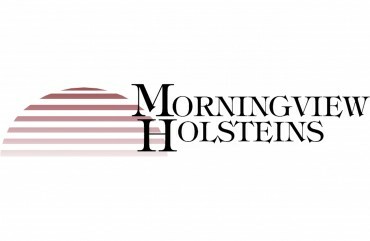 Congratulations to our friends at Morningview Holsteins with the No. 1 Red Female in the U.S., Morningview Smp 6303-Red with a GTPI of +2704 and backed by Super Roxy and the Early-Autumn Golden Rae family. Selling as Lot G8 in the Hammer Time at Heritage Sale is Morningview Mtry Dynasty, she is July 2015 Monterey daughter with nearly 3 points PTA Type and +2583 GTPI! And perhaps more important she is free of Mogul and Supersire bloodlines so she can be mated to almost every Chart-Topping GTPI sire! The dam of Dynasty is Morningview Uno Danika who recently was rescored VG-85 and is backed by an unique line of the Roxys! No less than 5 Mogul daughters of Morningview Super Roxy *RC are listed in the Top 25 GTPI Red and Red Carrier Cows (scored GP or better). Ladd P daughter direct from APPLE sells! Selling tonight on the Eastern Elite Sale is the March 2015 red Ladd P daughter direct from All-American Brood Cow, APPLE EX-96 3E! A beautiful heifer with a PTAT of +3.27 she sells as Lot 4. Morningview breeds #1 Red Carrier Bull! Morningview Holsteins has bred the #1 GTPI Red Carrier bull with an NAAB code. Morningview Rolling *RC is a GTPI+2625 EARLY Brekem son from Morningview Mgl Rox, the Mogul daughter of Morningview Super Roxy *RC VG-86, the former #1 GTPI Red Carrier cow in the breed. 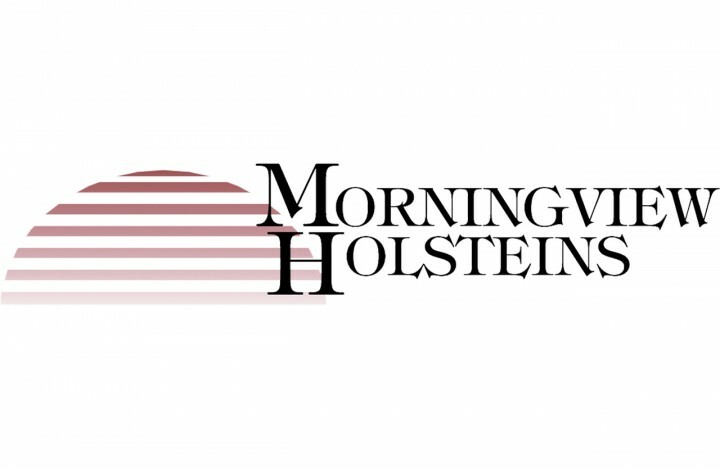 CLICK HERE for more information about Morningview Holsteins. Selling on Friday evening, June 27 in the National Holstein Convention Sale, Dubuque, Iowa is a beautiful August 2013 Jacey daughter with a GTPI of +2459 and a different sire stack. Morningview Jacey Randi sells with multiple contract interest as Lot 1 and is backed by a VG-86-2YR Robust followed by an EX-92 DOM Baxter and a deep line back to Roxy! Another great success for APPLE... after being Reserve Grand Champion at the World Dairy Expo Red & White Show behind her clone, Apple now has been classified EX-96! Congratulations to the Apple Partners! Morningview Super Roxy *RC VG-86 is proving herself as an extrodinairy brood cow. She is the dam of the #1, #6, #12, #16 *RC/Red GTPI heifers in the North America and she is also the dam of the #1 Red sire (with NAAB code), Morningview Attract-Red @ Semex. Attract is an EARLY Alchemy son and scores GTPI+2209. Morningview is still working with Super Roxy *RC and several of her high daughters. 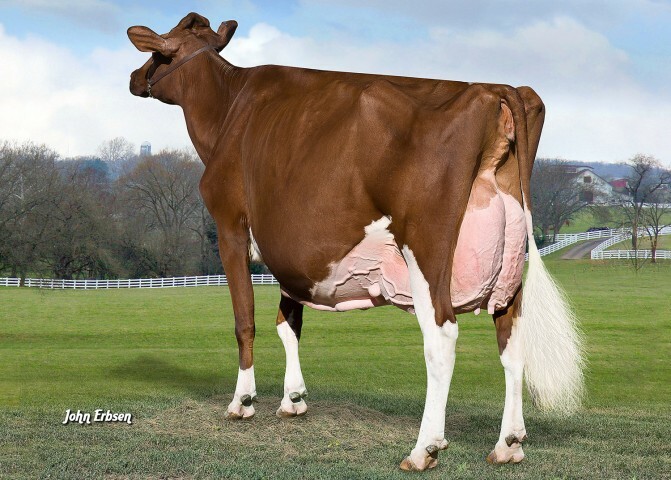 Morningview Super Roxy *RC VG-86 has been added to the donor page of Morningview Holsteins. Super Roxy *RC is currently the #1 GTPI cow on the Red/*RC locator list and has several high daughters including the #1, #6, #12 and #16 GTPI Heifers on the Red/*RC list. Selling in the Holstein Plaza Online Embryo sale are embryos of Morningview Super Roxy *RC. Super Roxy is the #1 cow on the *RC/Red Locator List and has already several high scoring daughters that are high on the charts. 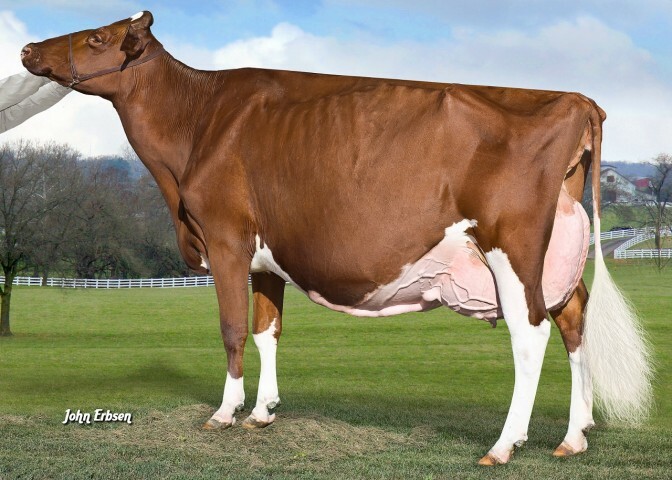 The #1 *RC/Red heifer in the breed is Super Roxys Mogul daughter Morningview Mgl Roxy *RC GTPI+2445, she has two full sisters at GTPI+2411 and GTPI+2364 and a maternal sister by Numero Uno GTPI+2380 in the top 25. Selling are Super Roxy *RC her Destined *RC embryos. Morningview Tag Sale huge success! The Morningview Tag Sale ended with gross sales of $246,000 on 23 head for an average of $10,696.00! The top seller at $50,000 came on Morningview Uno Regenia *RC, from the Roxy cow family at +2377 GTPI from VG-86 Super Roxy. With embryo and bull contracts, she was the choice of John Schneller, Dodgeville, WI. The 2nd high lot was the impeccable clone of Apple, EX-95, herself at $35,200. Due soon with a Gold Chip heifer, she now resides at Milksource Genetics, Kaukauna, WI. New photo of Ms Apples Angel-ET *RC, the now Excellent-92 Damion daughter of KHW Regiment Apple-Red-ET. Angel is currently being flushed and inquiries are welcome. New #1 *RC/Red Cow on Locator List... she's an APPLE! Ms Apple Brandy-ET *RC VG-86 VVVVV @ 2-08 is the new #1 GTPI *RC/Red Cow on the Locator list with GTPI+2133 +3.47T +512NM$. Brandy is a Shottle daughter direct from Apple who also jumped to +2010 GTPI with +3.20T! Selling on Saturday, March 17 at the Iowa State Sale as Lot #1 is the RED Nov. 2011 Colt P granddaughter of Apple! She has a GTPI of +2269 putting her among the top RED GTPI females in the U.S. Her dam is Apples Alexis by Shottle and VG-85-2YR! Also selling from Morningview is a *RC Colt P born Sept. 2011 and from a *RC Pronto VG-87 EX-MS followed by 8 generations of Excellent Roxys! Also from that family selling is a *RC Pontiac daughter fresh with second calf. Selling in the Breeders Holiday Classic Sale from Morningview Holsteins is a +2322 GTPI Bookem daughter from the VG-88-2YR Goldwyn x Oman Annette VG-87 GMD DOM and the great Converse Judys! Visit the online catalog for more elite offerings from Morningview. The Grand Champion of the 2011 International Red & White Holstein Show is now EX-95! Congratulations to the Apple Partners on developing such a tremendous individual and to KHW Genetics breeder of the great Apple! Two fantastic APPLE opportunities to the Sale of Stars... here is your chance to own a daughter of 2011 Grand Champion Red & White at World Dairy Expo! #1 GTPI *RC in the Breed Sells! Selling on Thursday, Oct. 27 in the Legends of the Fall Sale, Avon, NY is the #1 GTPI *RC in the breed, KHW Super Aderyn-ET, GTPI+2328! This beautiful Super from Goldwyn Aiko and the great Altitude sells with contracts and an embryo package by Alchemy! EARLY Alchemy x *RC Super daughter from the Roxys! Eight generations Excellent Roxys back these unique Alchemy embryos from a *RC Super daughter! Current bid: $875. Click here for more details. 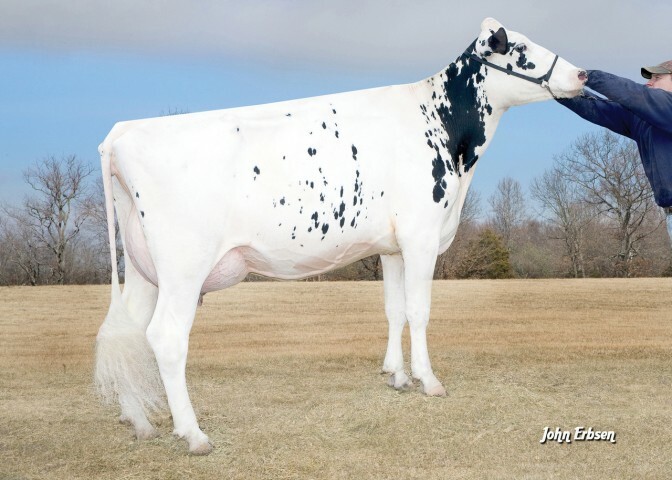 The genomic powerhouse Morningview Shtl Lucy jumps to GTPI+2190 PTAT+2.40 +652NM$. Palermo embryos from Shtl Lucy selling on Online Embryo Auction - Click here! Two fantastic offerings from the genomic powerhouse, Shtl Lucy GTPI+2156 sell tomorrow on the Central Wisconsin Summer Event Sale. Domain x Shtl Lucy SELLS! From the great genomic powerhouse, Shottle Lucy sells a +2230 GTPI Domain daughter on the National Covention Sale. From the great Lead Maes, Domain Lucy sells with contracts! Selling on Saturday, May 28 at the Field of Dreams Sale from Morningview Holsteins... 9/10 *RC Destry +2221G and 9/10 Goldwyn +2090G from the genomic giant transmitting, Shtl Lucy! Three fantastic offerings sell Friday, May 27 at the Chosen Few Sale, West Union, Iowa from Morningview Holsteins! • 1st Choice Bookem x Morningview Shottle Madilyn EX-92 DOM GTPI+2012 and from the Lead Maes. Selling on Saturday, April 2 in Rochester at the Minnesota Spring Special are two tremendous offerings from Morningview Holsteins. - #2 GLPI Paddy sells with $10,000 base AI contract plus $3,000 incentives. Born Sept. 2010, Paddy Loyal is from the Lead Mae family and a daughter of the super-transmitting Shtl Lucy. - Super from the Roxys! Selling is a 7/10 *TR Super daughter of Golden Rae *RC EX-92. Goldwyn Opportunity from Shtl Lucy sells at Milksource Sale! Morningview Holsteins sends a 10/10 Freddie from the Lead Maes to the Limited Edition Sale. A high GTPI/NM Freddie at +2207G and +677NM$ sells from Shottle Maui VG-87, GTPI+2103. Deep pedigree, high genomics and a fantastic offering from Holstein Plaza member, Morningview Holsteins! Holstein Plaza welcomes Morningview Holsteins. From daughters of Apple to offspring of Lead Mae there is something for everyone. Known worldwide for developing the Converse Judy family, Morningview continues to work with and develop the breed’s elite.